Politics and Society in the Baltic Sea Region is a series devoted to contemporary social and political issues in the countries surrounding the Baltic Sea. To this day, a considerable amount of research carried out in the social sciences especially at Baltic universities remains largely unknown to the wider academic community due to either language or publishing constraints. Significant analytical findings and relevant conceptual discussions about human and social development, socioeconomic challenges, media discourses or political culture in the region do not get the broad international attention they deserve. The specific aim of the series is therefore to publish work especially by emerging scholars, who focus on current issues in the Baltic states and their specific regional and geopolitical contexts and challenges. Open to a conceivably wide range of thematic, conceptual and methodological approaches, the Series seeks to become a forum for high-level social science scholarship that will significantly enrich international knowledge and understanding of the Baltic Sea region. The Series welcomes manuscripts in either English or German in all social science disciplines, including also economic and legal studies that demonstrate a clear regional focus, both in empirical and/or conceptual terms. Studies in history will be considered if they use social science methodology and clearly demonstrate the relevance of the particular historical inquiry for our understanding of contemporary politics/society. In order to ensure high quality and a broad readership, all manuscripts are subjected to international peer review and made accessible through open access repositories – both provided by the library of the University of Tartu as well as by international academic platforms. In addition, all publications are widely marketed through UTP printed and electronic media. If you are currently working on a book project or have just concluded a manuscript, please contact us. We would very much like to hear from you! Editorial Board: Daunis Auers (University of Latvia, Latvia), Li Bennich-Björkman (University of Uppsala, Sweden), Bernd Henningsen (Humboldt University Berlin, Germany), Rasma Karklins (University of Illinois at Chicago, USA/ University of Latvia, Latvia), Ene Kõresaar (University of Tartu, Estonia), Marju Lauristin (University of Tartu, Estonia), Lauri Mälksoo (University of Tartu, Estonia), Michael North (University of Greifswald, Germany), Tiiu Paas (University of Tartu, Estonia), David Smith (University of Glasgow, UK), Linas Venclauskas (Vytautas Magnus University, Kaunas, Lithuania), Ramūnas Vilpišauskas (Vilnius University, Lithuania), Henri Vogt (University of Turku, Finland). Die Reihe Politics and Society in the Baltic Sea Region widmet sich den aktuellen gesellschaftlichen und politischen Entwicklungen in den Ländern des Ostseeraums. Ein besonderer Schwerpunkt dabei liegt auf den baltischen Staaten sowie auf Arbeiten von Nachwuchswissenschaftler/innen an regionalen Universitäten. Die oft hervorragenden Ergebnisse aus Doktorarbeiten und anderen Projekten sind nach wie vor für ein breiteres internationales Publikum nur schwer zugänglich, was nicht nur an Sprachbarrieren, sondern auch unzureichenden Publikationsmöglichkeiten liegt. Dies hat zur Folge, dass viele wichtige Erkenntnisse zu gesellschaftlichen, politischen und sozioökonomischen Entwicklungen in der Region nicht die breite internationale Aufmerksamkeit erhalten, die sie eigentlich verdienen. Indem die Reihe ein Forum für neue, innovative Ansätze und Diskussionen der regionalen, sozialwissenschaftlichen Forschung bietet, wird sie das Wissen über und Verständnis für die Ostseeregion und ihre spezifischen Eigenheiten erheblich bereichern. Publikationen in der Reihe erscheinen in englischer und deutscher Sprache und umfassen alle sozialwissenschaftlichen Disziplinen und Teilbereiche. Darin mit eingeschlossen sind nicht nur Studien in den Politik-, Medien und Kommunikationswissenschaften, Soziologie und Ethnologie/Anthropologie, sondern auch volkswirtschaftliche und rechtswissenschaftliche Arbeiten, aus denen ein klarer regionaler und aktueller Bezug hervorgeht. Zeithistorische Studien sind ebenfalls willkommen solange sie einen konzeptionellen Ansatz verfolgen und/oder sozialwissenschaftliche Methoden anwenden sowie die aktuelle Relevanz der jeweiligen historischen Untersuchung für das Verständnis heutiger Politik und/oder Gesellschaften klar herausarbeiten. Um eine hohe wissenschaftliche Qualität sowie eine breite Leserschaft zu garantieren, werden eingesendete Manuskripte einer internationalen Begutachtung (peer-review) unterzogen. Bücher erscheinen in stark limitierter Auflage in gedruckter Form und werden ansonsten primär über Open Access Plattformen zugänglich gemacht. Die Publikationen der Reihe werden zusätzlich in gedruckten und elektronischen Medien und Verteilern des UTP vermarktet. Sollten Sie gerade an einem Buchprojekt arbeiten oder aber haben schon ein fertiges Manuskript in der Schublade, so freuen wir uns von Ihnen zu hören! Redaktionsbeirat: Dr. Daunis Auers (Universität Lettlands, Lettland), Prof. Li Bennich-Björkman (Universität Uppsala, Schweden), Prof. Bernd Henningsen (Humboldt Universität zu Berlin, Deutschland), Prof. Rasma Karklins (Universität of Illinois at Chicago, USA/ Universität Lettlands, Lettland), Dr. Ene Kõresaar (Universität Tartu, Estland), Prof. Marju Lauristin (Universität Tartu, Estland), Prof. Lauri Mälksoo (Universität Tartu, Estland), Prof. Michael North (Universität Greifswald, Deutschland), Prof. Tiiu Paas (Universität Tartu, Estland), Prof. David J. Smith (Universität Glasgow, GB), Dr. Linas Venclauskas (Vytautas Magnus Universität, Kaunas, Litauen), Prof. Ramūnas Vilpišauskas (Universität von Vilnius, Litauen), Prof. Henri Vogt (Universität Turku, Finnland). Vol. 1. 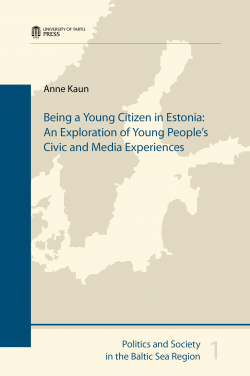 Anne Kaun, Being a Young Citizen in Estonia: An Exploration of Young People's Civic and Media Experiences. 2013. 133 p. ISBN 978-9949-32-274-9 (print), 978-9949-32-275-6 (online). The book gives an intriguing insight into how young people in Estonia, twenty years after the establishment of democracy, perceive their own role as citizens. It does so in a theoretical framework that stresses the embeddedness of the civic experiences in a media-dominated environment, thus closely linking civic and media experiences. Based on the analysis of both qualitative interview data and a relatively new method of using the internet as a complementary tool for engaging with open-ended diaries, the study explores the extent to which young citizens experience the media as being interwoven with their everyday lives and, in fact, constitutive of their social reality as citizens. With its particular focus on young Estonians, i.e. on a generation that has been brought up in a context of rapid political, economic and social change and that is well-known for its fascination with new communication technologies, the book is a valuable contribution to the growing international research on media and civic experiences. Vol. 2. Paul Jordan, The Modern Fairy Tale: Nation Branding, National Identity and the Eurovision Song Contest in Estonia. 2014. 150 p. ISBN 978-9949-32-558-0 (print), 978-9949-32-559-7 (online). This book provides a unique and intriguing insight into current debates concerning the relationship between nation and state as well as the political management of international image in today’s Europe through an examination of debates on nation branding and the Eurovision Song Contest. Europe is a contested construct and its boundaries are subject to redefinition. This work aims to advance critical thinking about contemporary nation branding and its relationship to, and influence on, nation building. In particular it focusses on key identity debates that the Eurovision Song Contest engendered in Estonia in the run-up to EU accession. The Eurovision Song Contest is an event which is often dismissed as musically and culturally inferior. However, this work demonstrates that it has the capacity to shed light on key identity debates and illuminate wider socio-political issues. Using a series of in-depth interviews with political elites, media professionals and opinion leaders, this book is a valuable contribution to the growing field of research on nation branding and the Eurovision Song Contest. Vol. 3. Raili Nugin, The 1970s: Portrait of a Generation at the Doorstep. 2015. 192 p. ISBN 978-9949-32-909-0 (print), 978-9949-32-910-6 (online). This book draws a sociological portrait of the age group born in the 1970s in Estonia and discusses its generational features and constructions. This cohort's coming of age coincided with the social and emotional turmoil of the re-independence movement in the late 1980s and with the transformation of society in the 1990s. This was the first cohort to negotiate its transition to adulthood in the new society, starting some new patterns of socialization, while also sharing some practices and experiences with older cohorts. Based on qualitative interviews as well as an analysis of media discourses and statistical data, the book traces the emergence of a new generation that draws its very own lessons from the past and from the social transformations that influenced life courses and careers. The book provides an intriguing discussion of socialization patterns and generation formation against the backdrop of post-socialist transformation. In addition, it provides a fascinating insight into the mind-set and experiences of a generation in the making, already shaping today's society and culture. Vol. 4. 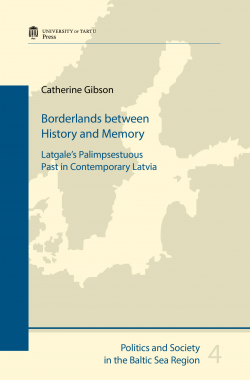 Catherine Gibson, Borderlands between History and Memory: Latgale’s Palimpsestuous Past in Contemporary Latvia. 2016. 192 p. ISBN 978-9949-77-296-4 (print).